The Fields Neighborhood Village is being created by Christopher Mann and Peter Scherrer. 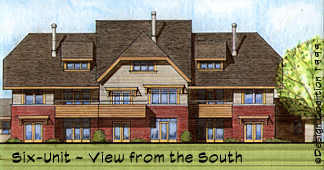 When it is complete, its 75 dwellings will be one part of an ecologically aware community that includes the Michael Fields Agricultural Institute (where Wisconsin farmers learn Bio-dynamic organic farming), the Lifeways Waldorf pre-school, the Nakomis organic bakery, and a community center, all close to two East Troy public schools and a small business district. Both the homes and the grounds will have a European quality, clustered around safe, narrow streets and laced with walking paths and trails. Each phase will have at it's center a green court, and residents of the tall six-unit buildings will have expansive views of the fields and land conservancy beyond, over the top of the earth-sheltered duplex units. There will be a mix of condominiums, single-family houses and duplex units, all energy-efficient (with passive & active solar systems) and built 'green' with low-toxin, environmentally safe materials. Design Coalition is designing the buildings and site layout. The planning team also includes leading landscape planners Atelier Dreiseitl of Hamburg, Germany. It's not an exaggeration to state that the quality of life depends on the quality of water. Development can seriously harm water quality, by decreasing porous recharge areas and by introducing pollutants. Here, rain water will be absorbed by abundant deep-rooted native plant species. Water from the catchment pond will be directed through Flow Forms to infiltration beds and wetlands before finding it's way to Honey Creek. Flow Forms are beautiful sculptural shapes that aerate and purify water. These 'water sculptures' were first created by John Wilkes and are used extensively by Herbert Dreisitl in his landscape designs. Above Left: View of the six unit condominium building. Above Right: View of the duplex. 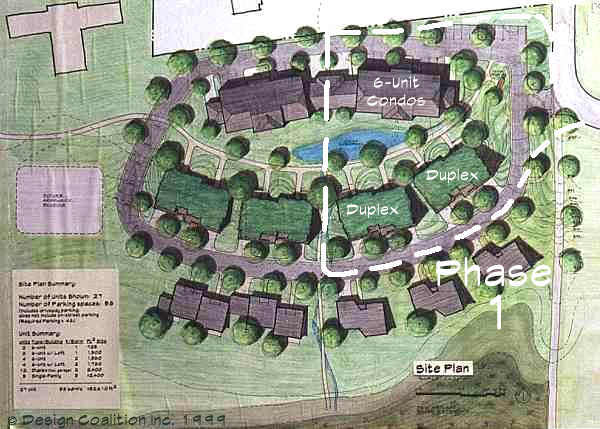 Click here to see more renderings of the Manshire Eco-Village. For more information about Fields Neighborhood Village, contact Christopher Mann at mfai@michaelfieldsaginst.org or Peter Scherrer at peterscherrer@scherrerconstruction.com or 262.767.2700. For a more detailed description of the Fields Neighborhood Village, visit the website for Homes Across America, an organization that opens the "front door" to resource efficient and high performance home building in the U.S. Visitors can search for homes around the country and find out about the "green" technologies and techniques used to build them. Home profiles offer resource efficient and low maintenance solutions for all incomes and sizes of families. Examples include everything from "off the grid" homes to high performance production models to multi-family apartments. For more current photos and more about Scherrer Construction, visit "The Tradition Continues" at their website.